Working with found object materials such as second-hand clothing, toilet paper, women's shoes, or potato sacks, Finnish artist Kaarina Kaikkonen creates moderate to large-scale installations that articulate the architectural space that contains her work. 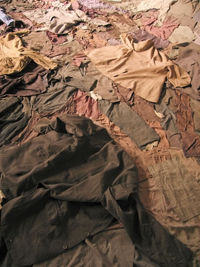 For the UW Art Museum installation, Kaikkonen constructed a wall-scaled work consisting of used and discarded men's jackets, an object for which she is most universally known. The jackets incorporate references to their previous owners from body shape and size to persona and business and also refer on a personal level to the artist's deceased father. The sheer number of jackets used to assemble the installation makes associations with the masses. Kaikkonen's art is transcendent. The demarcations between painting, sculpture, and architecture are blurred and the symbolic and emotive powers of her installations are profound and complex. The work is uncompromising and original, a testimony to her accomplishment as a foremost contemporary artist. Kaikkonen has exhibited extensively in Scandinavia and Europe. She is a recipient of the Finnish State Award (1989) and was invited to exhibit in the Echigo-Tsumnari Triennial (Nigata, Japan 2006), the Biennale Balticum at the Rauma Art Museum (Finland 2006), Omniart | Art Basel (Miami 2004 and 2005), and the 8th Havana Biennial at the Wifredo Lam Center for Contemporary Art (Cuba 2003). She lives and works in Helsinki. Funded in part by the Andy Warhol Foundation for Visual Arts, the Wyoming Arts Council through the National Endowment for the Arts and the Wyoming State Legislature, the National Advisory Board of the UW Art Museum, and Wyoming Public Radio.